A few months ago, in search of a baby present at a kids’ store in the Heights, I settled upon a soft stuffed owl that opened up into a tiny, newborn-sized blanket. 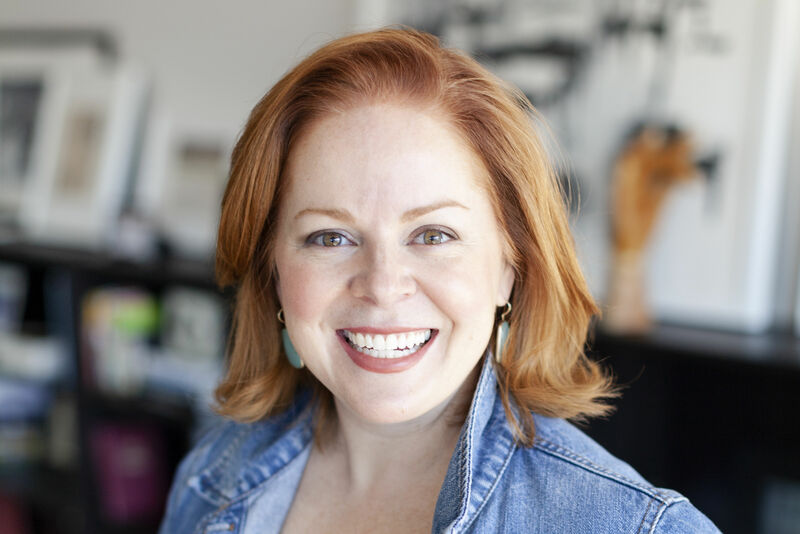 “So,” said the woman minding the store, reaching for some blue tissue paper, “this is for a boy?” When I answered in the negative, she appeared stricken, and hastily shrouded the gift in pink. I left trying to connect the dots. Owls are wise… and men are statistically more likely to be geniuses… so owls are for boys? A friend who bought a whale-themed baby sweater in Atlanta reported that she had gotten exactly the same response. “Because whales are blue?” my husband theorized, similarly perplexed. A few months later, I myself was pregnant, at which point it was time for my real initiation into the mysterious world of gendered baby objects. After a few months of intense study in the semiotics of onesies, I could now see that the owl was clearly for a boy because it lacked excessively long eyelashes (giveaway girl-toy clue), oversized lips, and, most importantly, a tiara. Shopping for my own fetus (a boy, and thus whale-and-owl-approved), I was confronted with a relatively limited array of “Lil’ Slugger” shirts, dark stripes, and eyelash-less fauna. I never stopped finding it all more than a little disturbing, but I did sort of come to understand it: as an expecting parent, you’ve got access to very little information about the individual identity of the human you happen to be growing, with the possible exception of this: girl or boy. Or, as the baby stores would have it: pink or blue. Princess or athlete. The principle extends to interior design, and forms the basis of many unfortunate nurseries available for perusal on Pinterest, where one can find A&M–themed neonate locker rooms, Disney Princess–packed dystopias, and not a few nurseries with the child’s name stamped all over the room, as if out of fear that some changeling might otherwise come in and lay claim to it. It was thus a relief to stumble upon these quirky spaces, whose designers looked to inspiration as varied as a world map, an heirloom painting, and, well, Bill Murray. 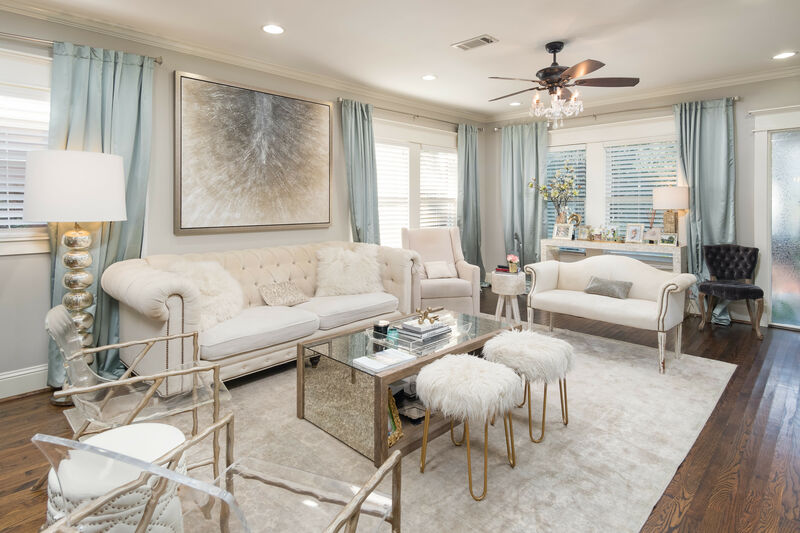 Whether you’re expecting yourself or just a fan of design that resists cliché, these rooms offer a glimpse of a world someone might actually want to bring a child into. Roving geologists Heather and Matt Averill met on the (apparently geologically fascinating) cliffs of Kilkee, Ireland, got engaged in Traverse City, Michigan, and married in Houston, Texas. 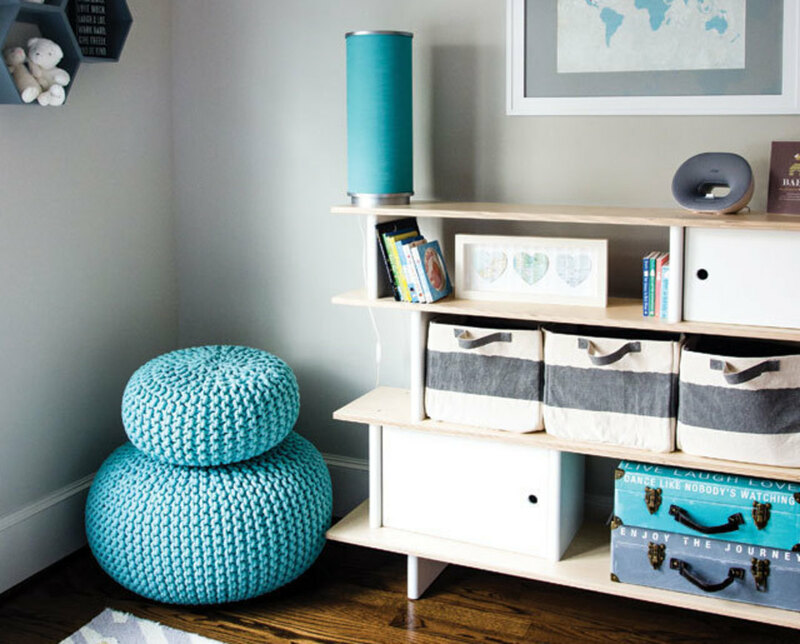 Not surprisingly, they wanted their first child’s room to feel as cross-continental as their first few years together. A framed map on the wall, procured from Etsy, tracks the Ireland-to-Texas odyssey. 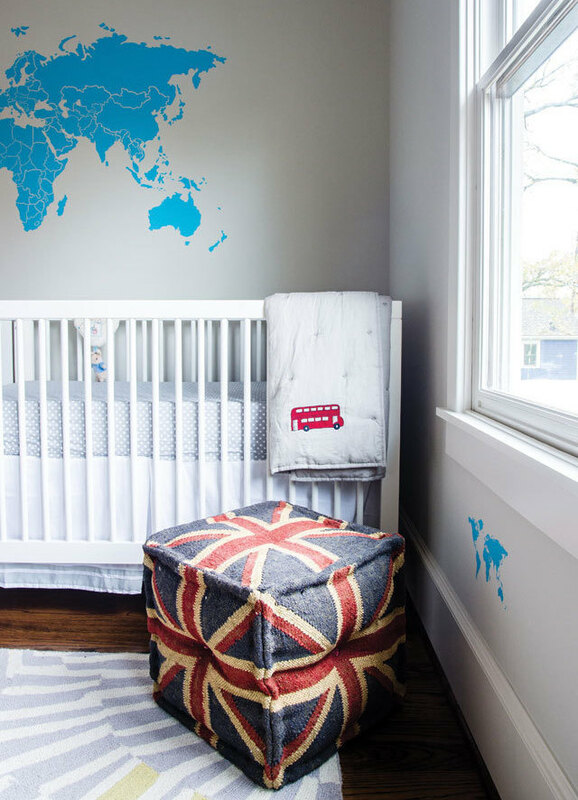 Just over the crib, the Averills attached another map, this one a decal; London-themed drawings by a Leeds artist adorn the walls; a London bus roves across a baby blanket; the Union Jack makes for fitting upholstery; and a Michigan state map turns a throw pillow into a geography lesson. 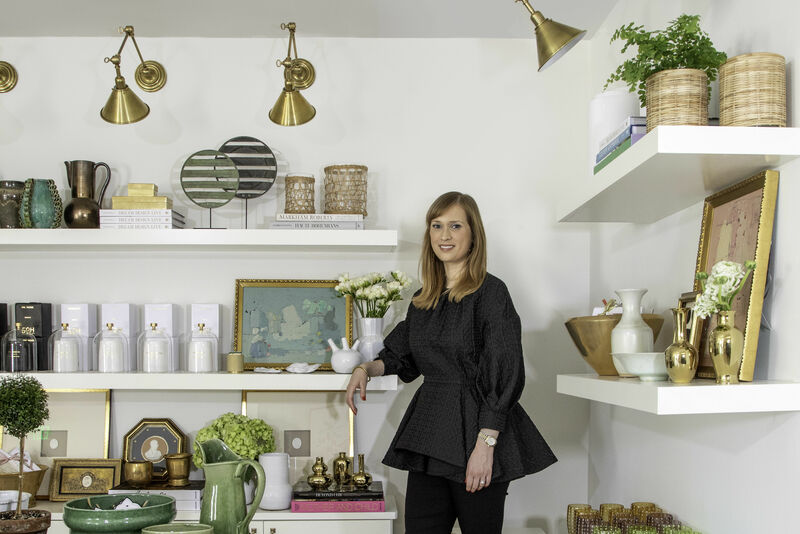 The Averills designed the room themselves, transforming the small space in their Heights home into an airy sanctuary with the help of Etsy and French/American nursery line Oeuf. “I wanted it to be a place that broadened her horizons,” says Heather, “a place for her to learn about the world.” It appears that the baby’s education in cartography will start with her name: Isla. When digging in the backyard of their historic Montrose home one afternoon, Amy and Kirk Grooms found a lead soldier in WWI-era clothing. 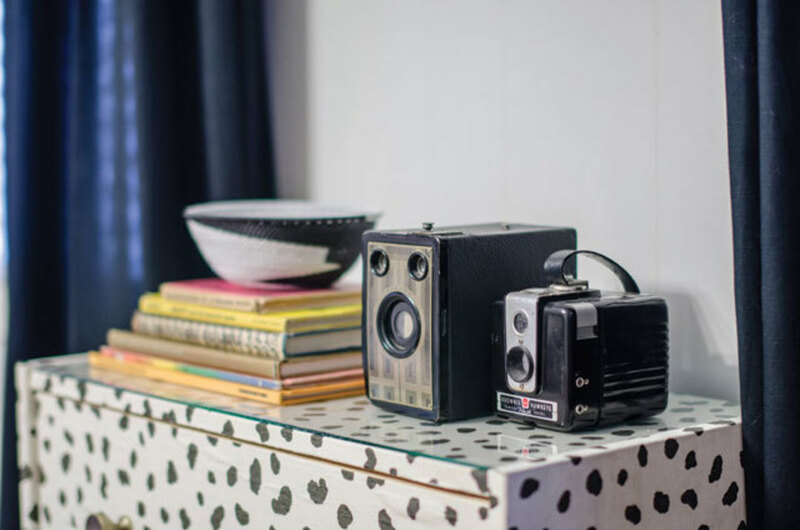 The toy, dating from the ’40s, would eventually be one of the objects around which their future nursery was designed. 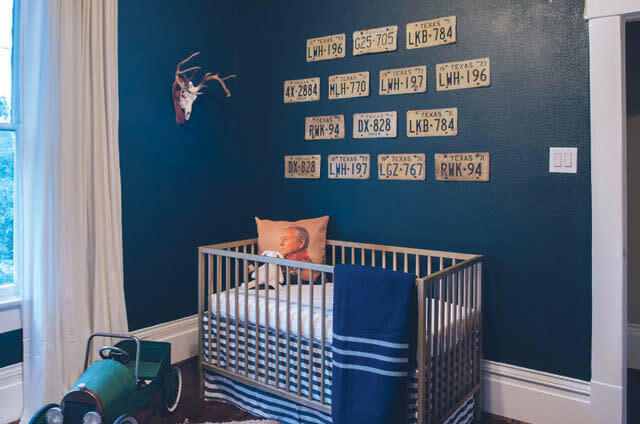 The room they chose for their nursery was already hung with a WWII-era promotional poster for the Merchant Marines—“You Bet I’m Going Back to Sea!”—which reads now as ironic; Amy hadn’t thought to keep it there, but her husband and Kristina Wilson (who also designed this nursery) prevailed. 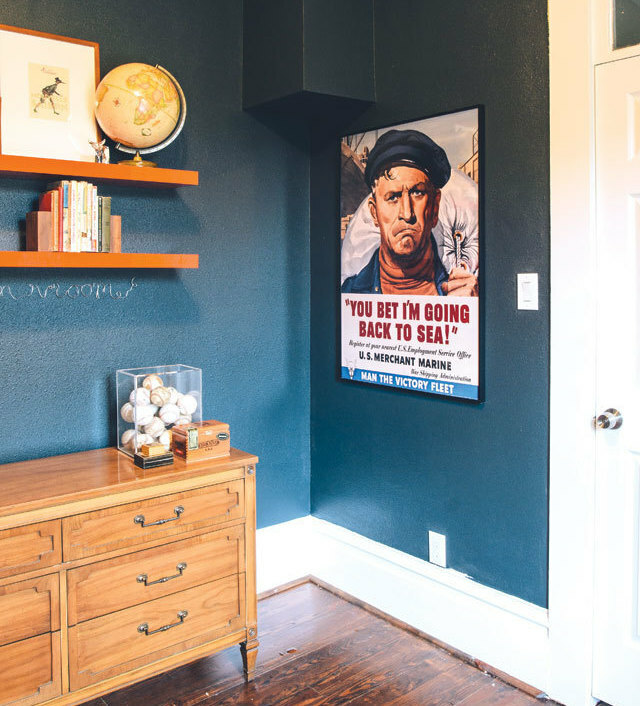 “It’s a giant poster of an angry-looking man,” says Amy, “but now I think it fits in the space.” The poster inspired the room’s blue-black walls with white trim, as well as a throw pillow printed with the now-famous Steve Payne digital painting of Bill Murray as a deadly-serious army general. “Our hipster is showing, right?” laughs Amy.